Walmart will open at 6PM on Thanksgiving this year. If you want to shop online, you're in luck -- you can shop their Black Friday sale all day online on Thanksgiving! 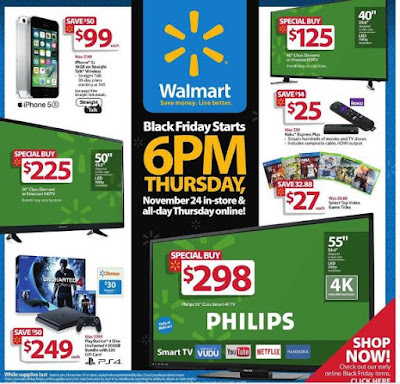 Walmart has increased their online Black Friday inventory by over 50% compared to last year, and more deals than ever will be available online. Of course there are still some in-store exclusives, but as long as you don't want those items, you might not have to set foot in a brick-and-mortar store this year. Walmart will once again offer wristbands for select items so that customers know when they are no longer available. Some stores may begin handing out wristbands prior to when the event begins. Customers who receive a wristband can then shop the store and will need to return within two hours after the event start time to receive their item. Store maps will be available this year as well to provide in-store shoppers an opportunity to plan out their shopping trip. We'll make sure to keep you updated as soon as store maps are released, just like we have in years past. We previously reported about their Holiday Helpers who are supposed to be available to help you check out faster, find items you may have missed, and open registers when needed. Stores recognize that their customer bases are divided on whether or not to shop on Thanksgiving. This year Walmart is ensuring that employees will not only be served dinner, but they will also receive a 25% discount on a basket of goods. You can view the ad HERE or check it out on the app.